The A Thompson on the Rugby Memorial Gates was originally identified as being Arthur Thompson listed on the Willans and Robinson Drawing Office Plaque, who enlisted at the start of the war. However without more information, we were unable to research him and record him on the centenary of his death. We have now been contacted by his grandson, who has provided us with enough information to publish this biography on the anniversary of his marriage in 1916. Arthur Thompson was born on 25th May 1889 at Margetts Road, Kempston, Bedfordshire. His father was Charles Thompson, a maltster and his mother was Amy (nee Slater). Arthur was the sixth child. By 1901 three more children had arrived. (They had eleven children altogether but two had died by 1911) The family were now living at 24 Howard Avenue, Bedford. Charles was now listed as a grocer, but his eldest son, also Charles (25) was a maltster. By 1911 several of the children had left home, including Arthur. Charles was still working as a grocer, at the same address, 24 Howard Avenue. (According to Google Street View, the property is still a grocer’s shop.) We have not been able to find Arthur in the 1911 census, but he was probably already living in Rugby. On 5th September 1914, he was listed in the Rugby Advertiser as having signed up with other members of staff from Willans and Robinson. Staff : A Thompson, W R Gamble, C Haines, T Campbell, G F Lewis, P W Clark, J Hughes, C H Waugh, H M Packwood, H R Ainsley, J R Hayward, L G Higgs, A Gibson, A L Jenkins, J Miller, and J Pethybridge. 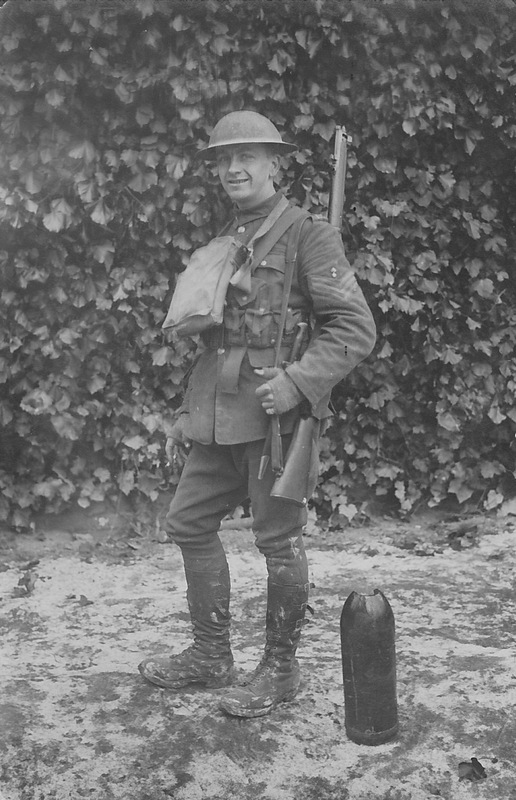 Arthur joined the Royal Engineers, as corporal, number 42242, and arrived in France with 70th Field Coy. on 30th May 1915. It is known that on the 18 Dec 1916 he was back in Rugby to marry Lilian Walton at Rugby Congregational Church. It is said that Lilian was a tracer in a drawing office. Presumably Arthur had met her at Willans and Robinson. The Walton family came from Crick, but at the time of the marriage she was living at 24 Benn Street, Rugby. 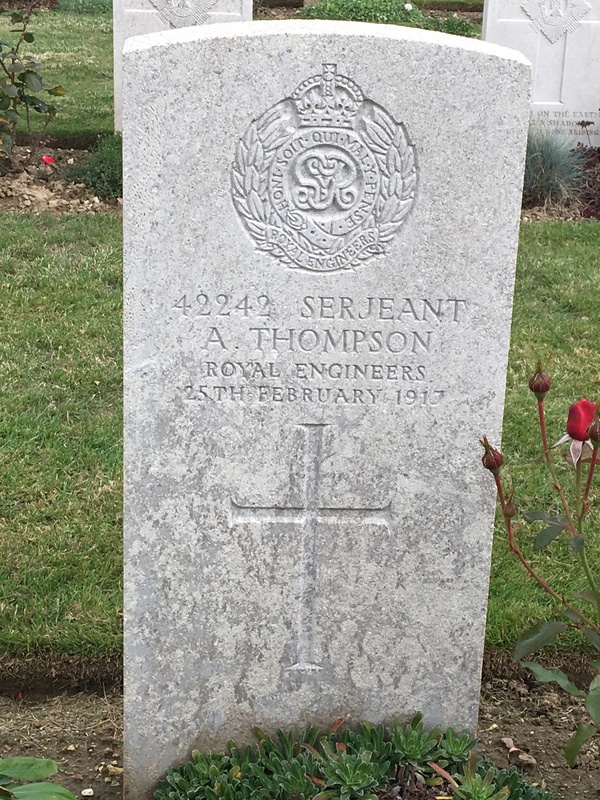 Serjeant Arthur Thompson was Killed in Action on 25th February 1917, near Arras in France. There is no report of any deaths on that day in the war diaries, but the family was told that the artillery was firing over their heads during an advance and a shell fell short and killed him. He is buried in the Faubourg d’Amiens Cemetery, Arras. He is remembered on the Willans and Robinson Drawing Office plaque, as well as the Rugby Memorial Gates. He is also remembered on the Bedford, All Saints memorial. He was awarded the British and Victory medals as well as the 15 Star. Arthur and Lilian’s son, Aubrey Arthur Thompson was born on 4th March 1917, one week after his father’s death. Lilian later remarried and moved away from the area. Note: We wish to thank Clive Thompson, grandson of Arthur, for the use of family photographs in this biography. This entry was posted in Biography and tagged 1917, Kempston, Royal Engineers, Thompson, Willans and Robinson by Christine. Bookmark the permalink.